There is no need to state the obvious but cubby house designs have come a long way than a couple pieces of wood your dad nailed together. Now there are cubby houses that have so many features and added extras like slides, added rooms, balconies, the list could go on. But this does not mean every design is created to meet ‘one size fits all’ approach. What’s right for some kids may not be suitable for others. Choose cubby house design based on the size of the cubby house and your backyard, style, material, colour, additional features and safety. Once you have chosen the right cubby house design for your kids, the next question is usually ‘what games can we play?’. It is important to be able to provide your kids with different types of entertainment and physical outdoor activities. So many of our kids are not getting enough time outside so a cubby house is a great way to combat this problem. Below we’ll go over a few different ways you can get your kids to stay interested in the cubby house and get them to play outdoors more. Social play is a term used when children are playing with other children. Children are interacting with other children pretty much as soon as they are born, especially if you have friends with kids around the same age. This is a great setting to put your kid in so he/she can learn social skills and etiquette as well as sharing and cooperation. Social play shapes children and teaches them to function out in the real world; moral reasoning is developed as well as social values. You can call over a few friends and have them play in the cubby while the parents spend some time outdoors too, maybe even make it a barbecue? Fantasy or pretend play is where your kids can try out different situations, try out different languages, or pretend to be someone they’re not. This is something that can really push kids’ imagination so they can let their creativity free. They can take on what they think adult roles are and think of solutions in abstract methods. This is a great way for children to really push the boundaries of what they know by using new words, numbers, maybe dreams that they have had, or stories they have been told. The possibilities are endless. It’s also a way for children to express to you what they want to do or be when they grow up. This is a great way to play with your kid, so why not join in with them and see what happens. Physical play is the term used for when children can run, jump, play and engage in physical activity. A great example of physical play is hide and seek. Physical play is a great way for your kids to engage their muscles and build strength. This is one of the best ways for your child to get exercise as well as engage in social activities. Not enough kids are exercising as they are getting more used to watching TV or sitting in front of a computer which means that child obesity numbers are going up. 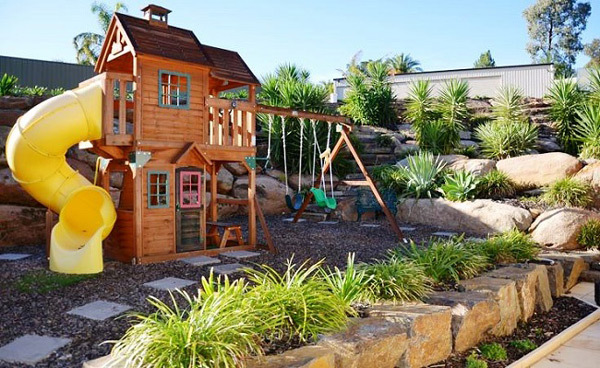 You should choose a cubby house design that has a slide attached to it or something else that requires a little bit of physical activity all while remaining fun. Constructive play refers to the type of play where children learn to create things. It can start from when they are very young and changes as they get older. You will see younger children doing this by putting different things in their mouths to learn what is food and what is not. This moves on to being building blocks, sand pits or drawing. Depending on the exercise, your child can learn to differentiate between items. Problem solving is something that can make your child feel good once they’ve accomplished something. Children who focus more on constructive play are more likely to come up with their own ideas and find numbers and concepts easier to grasp. The best way for you to utilize these ideas is by mixing them up. Choose different days for different types of activities and see what your kid enjoys more and what they might be struggling with. This is a great experience for you to bond and start to develop your child’s personality and traits as well as find out who they want to be. And cubby houses are ideal for achieving all this as they are an outdoor activity that is fun for both the child and parent.